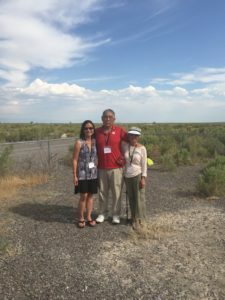 Three weeks ago I joined my mom, Ibuki Hibi Lee, and Michio Aoyagi for the Grand Opening of Topaz Museum in Delta, Utah. 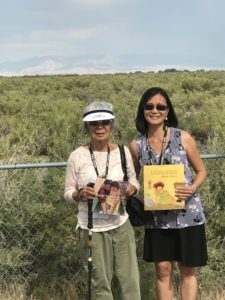 As young children, they had lived at Topaz, one of the ten Japanese American internment camps during WWII. They met decades later in the Bay Area where they were born and now live. 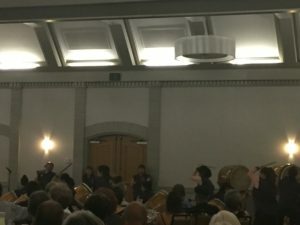 My mom, her brother Satoshi, her mother Hisako Hibi, and her father Matsusaburo “George” Hibi were among the 8,000 Japanese Americans who were interned at Topaz. My grandparents, who were professional artists, were very involved at Topaz Art School. 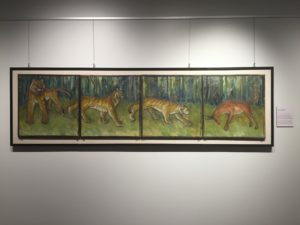 The art school was directed by Chiura Obata, who had been a Professor of Art at UC Berkeley for 10 years prior to the internment (and later returned to teach there). He and my grandfather were close friends and served as best man at each other’s wedding. 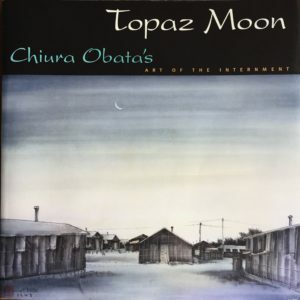 When Obata was released early from Topaz, my grandfather took over as director of the art school. My grandmother taught classes to children; my mom and uncle were students. The art school gave them all a sense of purpose and peace behind barbed wire. 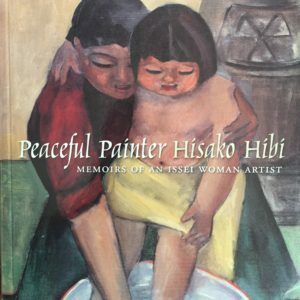 My mom published an edited book, Peaceful Painter Hisako Hibi: Memoirs of an Issei Woman Artist (Heyday Books, 2004), containing some of my grandmother’s artwork and memoirs. 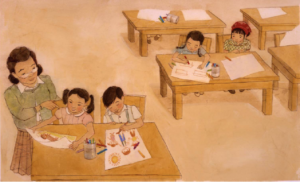 I published a picture book, A Place Where Sunflowers Grow (Lee & Low/Children’s Book Press, 2006), incorporating the Topaz Art School. Really, how could I not go to the Grand Opening with my mom and Mich? 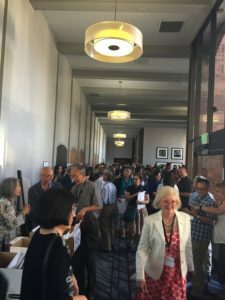 The internment history made it a bittersweet occasion. Yet it turned out to be an overwhelmingly positive experience. Below are the Topaz survivors who were able to attend the events. I wanted to hug each and every one of them! 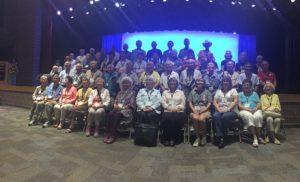 Three moments during the weekend made my eyes well up: at dinner and at the opening ceremony when the survivors were asked to stand, and when this group photo was taken. Each of them had traveled such a long distance in life. What were their stories? 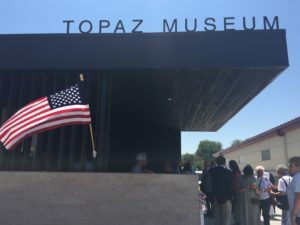 Topaz Museum is a testament to the strength of the human spirit. 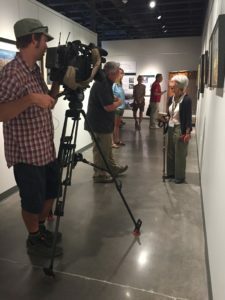 It features art as well as artifacts from the camp, displaying the beauty that internees managed to create during one of America’s darkest chapters. Of all the camps, Topaz held the highest concentration of professional artists. 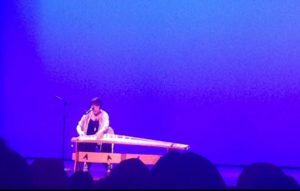 Topaz Art School served several hundred students, from young children to senior citizens, in classes that ranged from ikebana (Japanese flower arrangement) to oil painting. 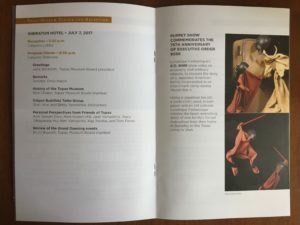 Not only did classes allow for creative expression and exploration, they documented camp life since internees were prohibited from owning cameras. Seeds for the museum were planted 35 years ago in two of Jane Beckwith’s Journalism classes at Delta High school. Over the years Jane, the Founder and President of Topaz Museum, worked tirelessly with the help of others to grow these seeds into the museum. A Place Where Sunflowers Grow is now available at the museum gift shop. 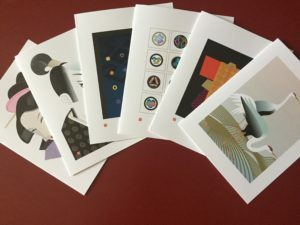 …and, of course, artwork. The museum features many artists; here is one each of my grandparents’ pieces. Print of Laundry Room by my grandmother Hisako Hibi. The original is at the JANM in LA. 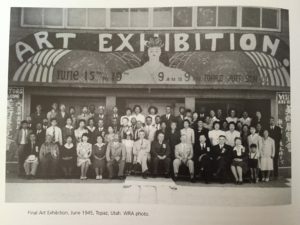 In 1972 my grandmother donated the majority of my grandfather’s artwork to the UCLA Japanese American Research Project. 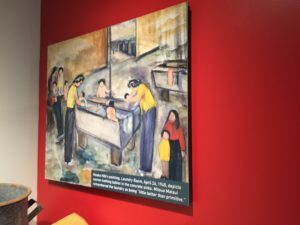 In 1996 my mother donated the majority of my grandmother’s internment camp artwork to the Japanese American National Museum. 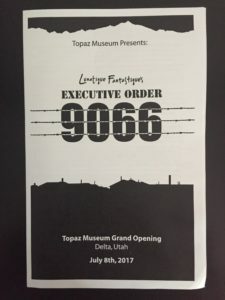 My grandparents’ pieces at Topaz Museum were donated by other individuals, known and unknown to my family. It was a joy to see their pieces, especially in this setting — in an ironic sense, back home where they belong. 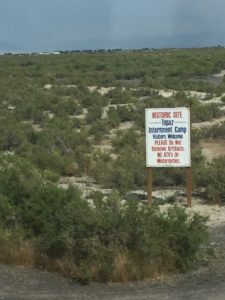 The last event that I attended happened to be the most sobering one: visiting the site of the internment camp itself. 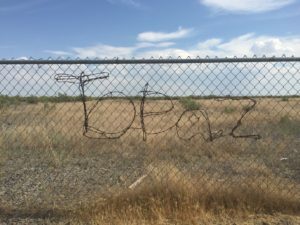 What remains of Topaz is an open field, now a historic site. 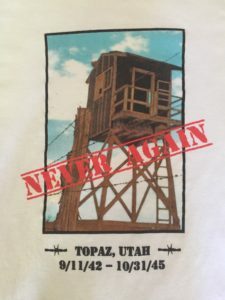 Standing there, I could only imagine the shock of being removed from the Bay Area — where most of the Topaz internees had lived — to the one-square-mile of desert surrounded by barbed wire and policed by armed guards. The heat alone felt oppressive. To give you an idea: an EMT truck was stationed there in case any of the guests should need medical care. 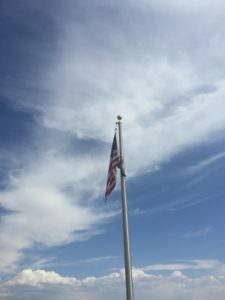 When I jumped back on the bus and felt the rush of cool air from the AC, my heart sank at the thought that the internees didn’t have even electric fans to provide some comfort. How did they cope with the hardships? From physical to psychological? How did they endure? While these were not new questions for me, they now felt more tangible. 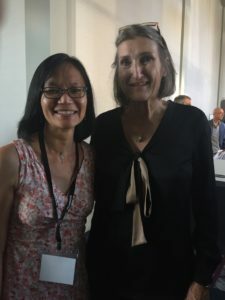 After the events were over, my mom asked me, “Was there anything about Topaz that surprised you?” It was a thought-provoking question, and I was surprised that only two things came to mind. 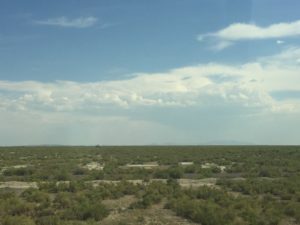 The first was that there was a great deal more sagebrush than I had imagined. My mom said that indeed a lot had grown since Topaz days. The second was that Delta was located much closer than I had imagined. Mich said that the town had indeed grown over the years and spread closer to the site. This was my first visit to Topaz, so I felt relieved that I had managed to depict my book fairly realistically. 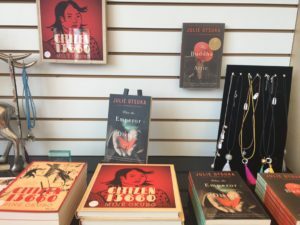 I’m currently writing another children’s story based on the Japanese American internment. Being at Topaz was both grounding and inspiring for my work. 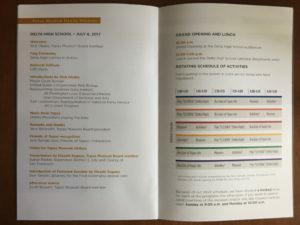 I wrote while there and have continued to write since (which is partly why I’ve taken so long to blog about the museum!). 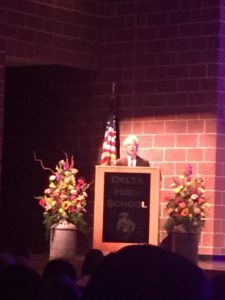 I also left with a better understanding of my mom, even though she had spoken openly of the internment while I was growing up. There was nothing like stepping back into history for a bit with her to bring me to a greater place of knowing. 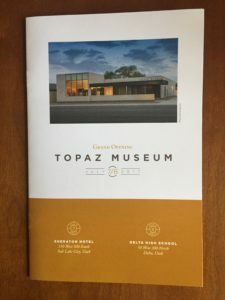 If you ever find yourself in that neck of the woods (or desert), please stop by Topaz Museum. It’s filled with gems from the desert. And you’re sure to learn a thing or two about American history.